Here’s an air purifier that does more than just purify your air and it looks good doing it. It’s for while you’re at your desk, so if for some reason you think the air needs filtered through while you’re at your desk. Plus in addition to filtering the air, it has an open container area that you could use for various things, such as using it as a container or even using it as a flower pot. Hopefully having flowers in there that need watered won’t hurt the electronics at all though. The manufacturer is the one that suggest using it as that, so surely the electronics required for the air purifier are well protected. It also has a blue luminescent night light that is controlled through an on/off switch. For that blue light it has a total of 3 Led lights. The purifier uses a carbon filter to clean your air. 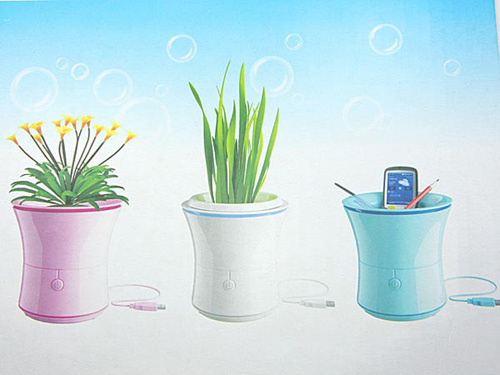 You can purchase the Flowerpot USB Air Purifier for $29.90 from Gadget4all.